I lived in Vietnam for about 3 months in early 2012. My photography in the country was unfortunately quite limited. But I did manage to see several impressive temples and sights in and around Hanoi. When I think of east and southeast Asia, this is the photo that comes to mind. 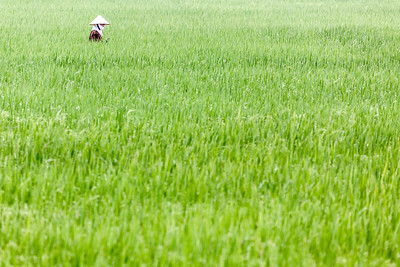 A solitary worker in a rice paddy. Available in the following sizes (Rectangle B): 12x8, 18x12, 24x16, 30x20, 36x24. A swallowtail butterfly I spotted in Vietnam's Ba Vi National Park, northwest of Hanoi. Available in the following sizes (Rectangle B): 12x8, 18x12, 24x16, 30x20, 36x24. A glassy tiger butterfly I spotted while on a day trip to Ba Vi National Park, a bit north of Hanoi. Available in the following sizes (Square): 10x10, 12x12, 16x16, 20x20, 24x24. 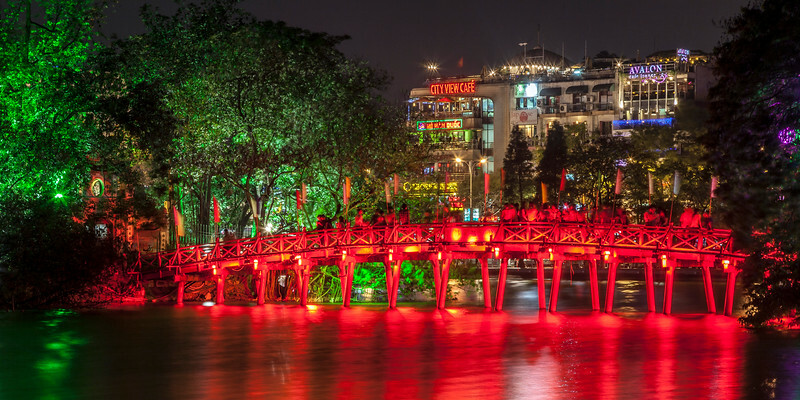 The Huc Bridge traverses a portion of Han Kiem Lake, in the center of Hanoi, and provides pedestrian access to Jade Island and the Temple of the Jade Mountain (left). 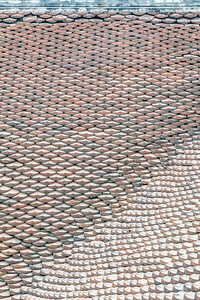 Available in the following sizes (Panorama A): 20x10, 24x12, 32x16. I took this photo when I stopped to stretch my legs when I was riding my motorcycle from Hanoi to Tam Dao National Park, in Vietnam. I love Buddhist temples, and there aren't too many in Vietnam, so whenever I found one, I'd tend to explore and photograph it. Available in the following sizes (Rectangle B): 8x12, 12x18, 16x24, 20x30, 24x36. I took this photo when I stopped to stretch my legs when I was riding my motorcycle from Hanoi to Tam Dao National Park, in Vietnam. I love Buddhist temples, and there aren't too many in Vietnam, so whenever I found one, I'd tend to explore and photograph it. Available in the following sizes (Rectangle B): 8x12, 12x18, 16x24, 20x30, 24x36, 30x45. I lived in Hanoi, Vietnam for a few months in early 2012. It is a bustling city, and as a photographer that focuses primarily on nature and landscapes, I found it challenging to find the time to get far enough away from the city to feel like I was actually out in nature. So when I really wanted to take photos, I had to find interesting locations in the city. One such location was the Temple of Literature, where I got this shot. Available in the following sizes (Rectangle B): 8x12, 12x18, 16x24, 20x30, 24x36, 30x45. The English ability in and around Dalat, Vietnam, is quite low, so when I rented a scooter and drove around the region, I wasn't usually able to find anyone who could tell me about the things I found. 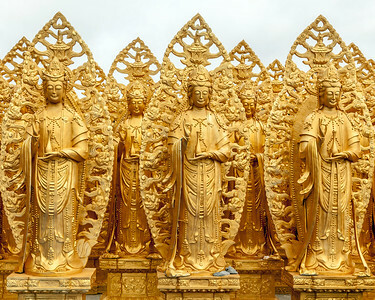 One place I stumbled upon was some type of temple, wherein I found these – and many other – gold (painted) statues. I'm not sure what religion they represent, but it looks fairly Buddhist. 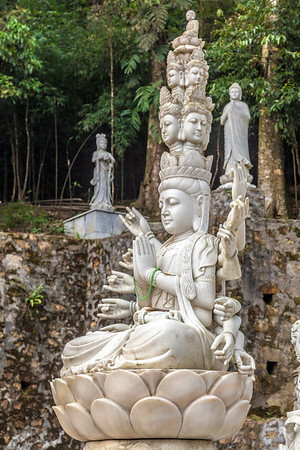 A quick Wikipedia search informed me that almost 75% of Vietnamese report following either Vietnamese folk religion, or do not have any religious affiliation, so perhaps these figures are in some way connected to Vietnamese folk religion. Available in the following sizes (Rectangle A): 10x8, 14x11, 20x16, 24x20, 30x24, 40x30. 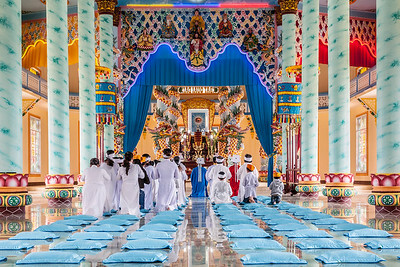 I stumbled onto this temple, Dien Tho Phat Mau, a bit outside of Dalat, Vietnam, completely by accident, and happened to be there right as some kind of prayer was being performed. Having come here from Cambodia, where I spent several days at Angkor Wat, the modernity, bright colors and fluorescent lights with a religious connotation were a pleasant surprise. Available in the following sizes (Rectangle B): 12x8, 18x12, 24x16, 30x20. This flower is called a burgmansia, which is unfortunately extinct in the wild. They are still grown ornamentally, though, and I took this photo near Dalat, Vietnam. Available in the following sizes (Rectangle A): 10x8, 14x11, 20x16, 24x20, 30x24. I took this photo when I stopped to stretch my legs when I was riding my motorcycle from Hanoi to Tam Dao National Park, in Vietnam. 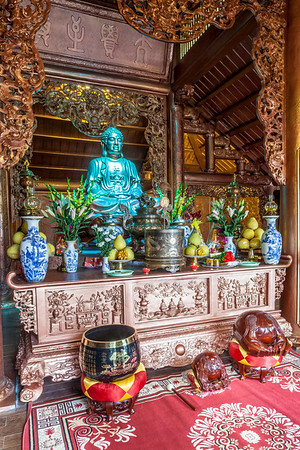 I love Buddhist temples, and there aren't too many in Vietnam, so whenever I found one, I'd tend to explore and photograph it. Available in the following sizes (Rectangle B): 8x12, 12x18, 16x24, 20x30, 24x36.